Walt Disney World Resort Hotels: The Deluxes’ Part 1! Hello everyone! 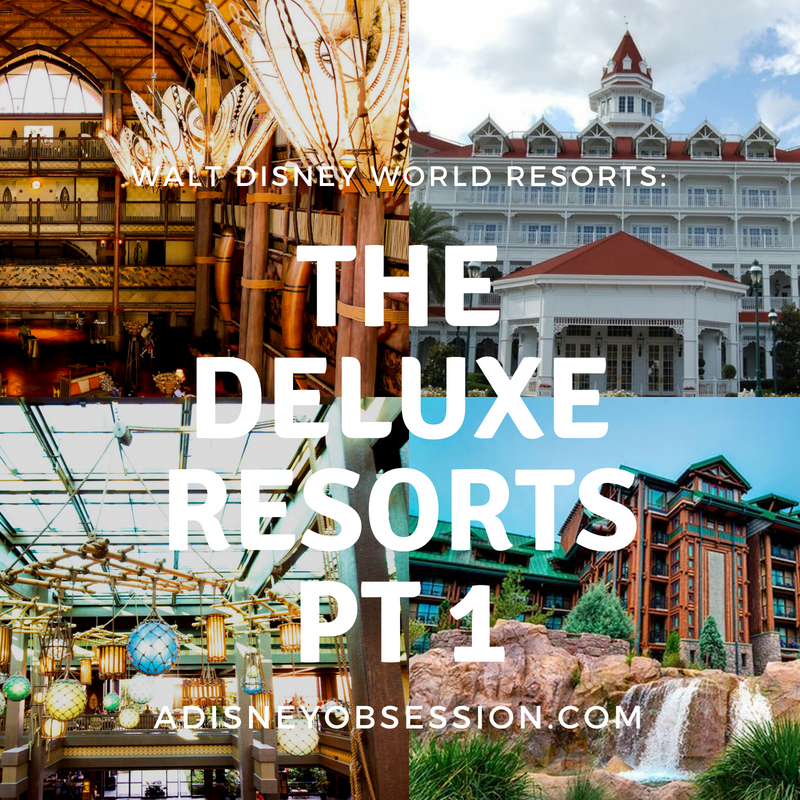 Today we are continuing on in the Walt Disney World Resort Series with The Deluxe Resorts! I will be splitting the deluxe resorts and the villas into two post each, because there are more resorts at this level than any other! Today I’ll be focusing on four different Deluxe Resorts, and I’ll be sharing the different rooms available, and food options at each resort! All prices are as of July 28th, 2018. Okay, let’s get started! 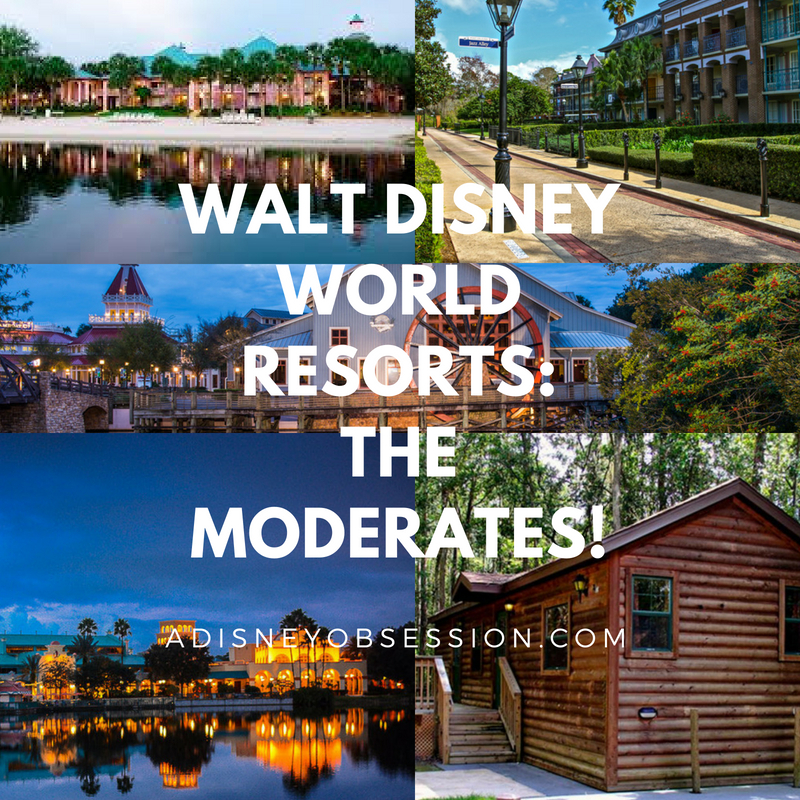 Walt Disney World Resort Hotels: The Moderates! Hello friends! I hope you are well! 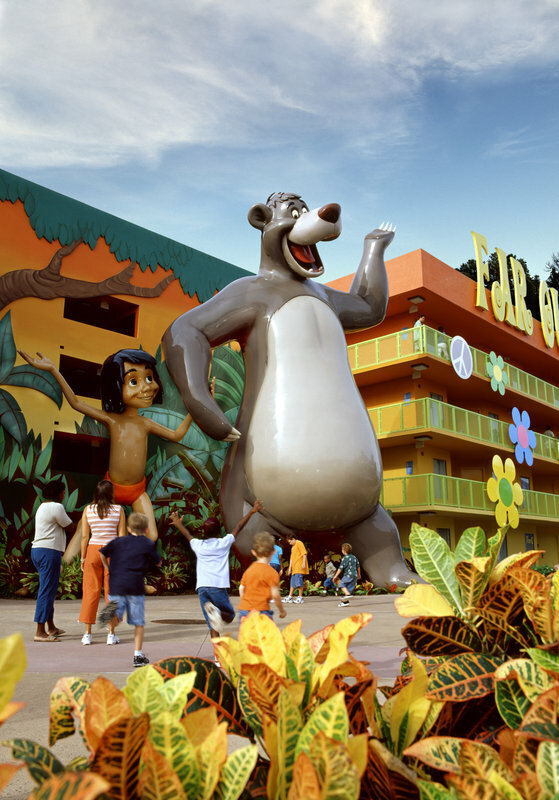 Today we are jumping back into the post series all about Walt Disney World Resort Hotels, today focusing on the Moderate resorts! I’ll be sharing the different resorts in the moderate level, sharing the starting price, room configurations, dining options, and more! If you missed the post all about the Value Resorts, you can find it here! Okay, let’s get started! Walt Disney World Resort Hotels: The Value Resorts! Hello everyone! I hope you are well! In today’s Disney post, we are talking all about the Value Resorts at Walt Disney World! I’m going to take you through all of the different resorts at this level, give a brief breakdown of types of rooms available (and the pricing as of June 2018), and a little bit about each resort. 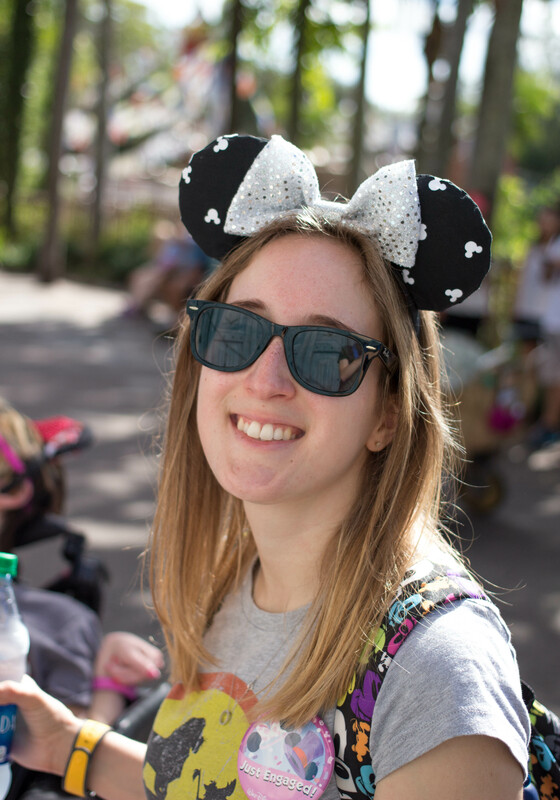 I will be going through all Walt Disney World Resorts in the coming weeks. 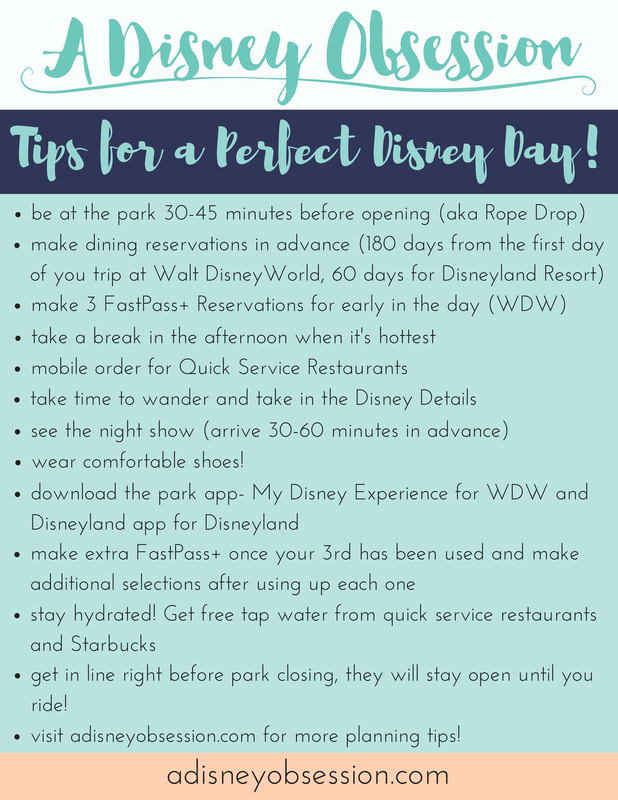 If you’d like to stay on site at Walt Disney World, this post series is for you! Okay, let’s get started! What is a Value Resort? 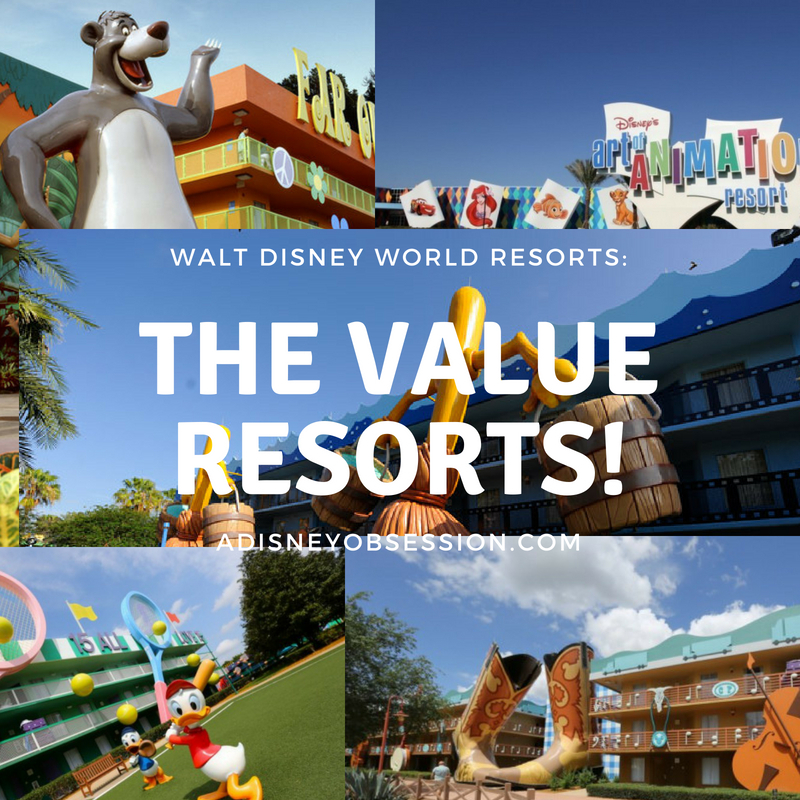 The Value Resorts are the lowest level of resorts at Walt Disney World, therefore they are the least expensive! The themes are more “in your face Disney” and are generally very popular with families. School groups tend to stay at the Values as well. Value Resorts have larger than life statues of characters from Disney films, and each resort has a different theme. Within the resorts there are different sections, and each section has a pool, with the largest pool being closest to the main building! All resorts have a food court, arcade, shop, and basic hotel amenities. Okay, let’s get to the resorts! 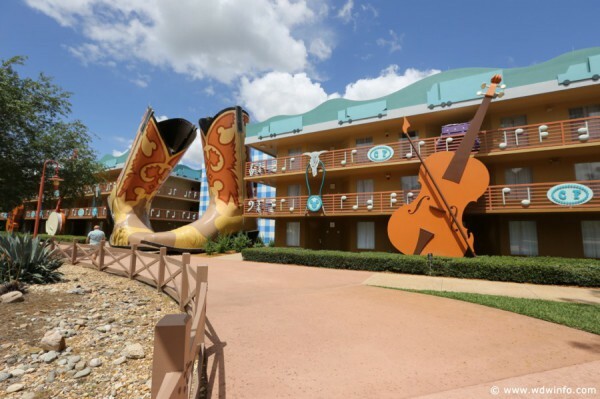 All Star Music– This resort opened 1994, and I stayed here in 1997 on my 1st trip to Walt Disney World! Sections of the resort are different genres of music, and I remember staying in the Country section! They have two types of room configurations: 2 Double beds, or a family suite that includes 1 queen bed, 1 twin sleeper chair, 1 double size sleeper sofa. Standard location or preferred location (close to the main building) is available. Intermissions is the name of the food court. 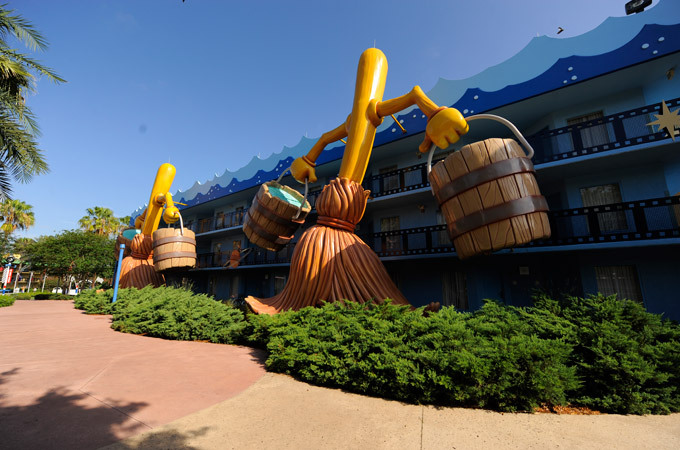 All Star Movies– This resort opened in 1999! It has different sections themed to different movies like Fantasia, Toy Story, 101 Dalmatians and more! All rooms have 2 double beds, and standard or preferred rooms are available. The food court is called World Premier! Look at the film reel railings! It’s all in the details. All Star Sports– All Star Sports opened in 1994! Each section is themed to different sports, like football, tennis, and more! All rooms have 2 double beds, and standard and preferred rooms are available. End Zone is the name of the food court. 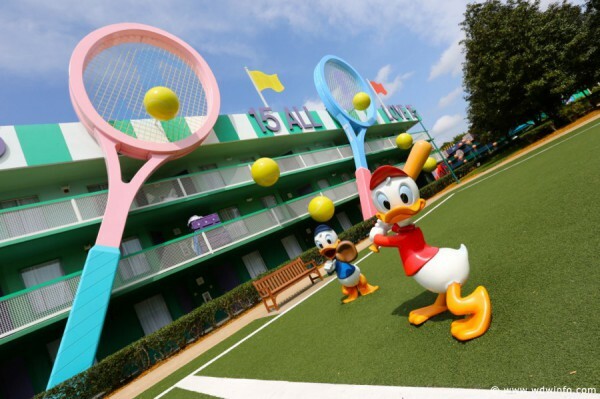 Most sports groups (like cheerleaders) stay here when they visit Walt Disney World for tournaments. Rooms starting at $120/night (as of June 8th, 2018). Resort is in the Wide World of Sports Resort area. Pop Century Resort opened in 2003! Each section is themed to a decade, from the 50’s to the 90’s. The rooms have either 2 double beds, 1 king bed, or 1 queen bed and 1 queen table bed. The entire resort is undergoing renovations (one section at a time), and the rooms are really nice! The views are standard, standard pool view, preferred, or preferred pool view. The food court is called Everything Pop! I’ve stayed here 3 times and as of right now it’s my favourite Value Resort! This was the first resort we stayed in an accessible room, and it was in a preferred location which was nice! I also find that the resort area is more central, and it’s a bit faster to get to each of the parks. Starting at $155/night, $342/night for suites (as of June 8th, 2018). Also in the Wide World of Sports area. Pop Century and Art of Animation are connected by a bridge! The gondola system will be coming to these resorts as well! (Estimated completion mid 2019). 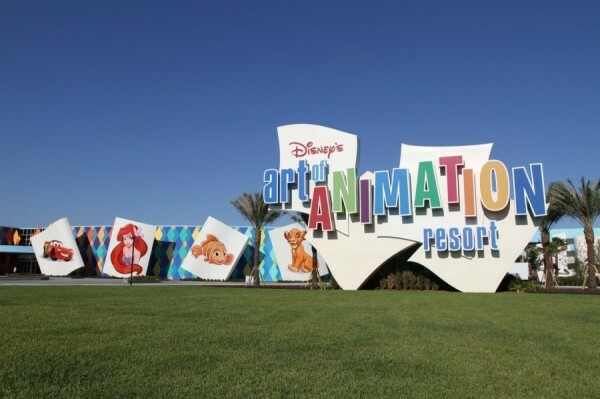 Art of Animation is the newest Value resort, and it opened May 2012. It’s a little different than the other Values! I would call it Moderate-lite (next level up of resorts), or value-plus. There are 4 sections, 3 are made up of family suites (Finding Nemo, The Lion King, and Cars) and 1 section is standard rooms (Little Mermaid). For the family suites, all rooms have 1 queen bed, 1 double table bed and 1 double size sleeper sofa. For the standard rooms, you get either 2 double beds or 1 king. These rooms are HEAVILY themed to the section, and they look awesome. I hope to stay here someday! Little Mermaid section would be my first choice. (Ethan and I actually considered staying there on our trip in 2013, but with the room discount available we stayed at a Moderate resort for close to the same price). The food court is called Landscape of Flavors, and is supposed to be one of the best food courts of the Value Resorts! stay in a preferred room if you can, it’s worth the time saved walking back to the rooms! because lots of families stay here, there tend to be a lot of buses at the end of the night at the parks! If you’d like to listen to me talk about the different resorts instead of reading about them, check out the video below! If you’d like to learn more about these resorts, visit the Walt Disney World website here. Thank you so much for joining me today! Have you ever stayed at a Value Resort? Let me know in the comments below!